Charlotte Bronte, Shirley and the Luddites -Review of the Inaugural Luddite Memorial Lecture. The inaugural Luddite Memorial Lecture, dedicated to Lesley Kipling, attracted around 130 people to the University of Huddersfield. After introductions by the Chair of Huddersfield Local History Society, Cyril Pearce and local MP Barry Sheerman, Dr Matt Roberts of Sheffield Hallam University delivered a thought-provoking and enjoyable talk on the above topic. He set out to re-define the political position of Charlotte Bronte through her characterisation of the Luddites in her novel Shirley and at the same time explore whether the work threw any light on the historical Luddites. It could be said that to some extent Dr Roberts was, on this occasion, attempting to rescue not the Luddites, but Charlotte Bronte from ‘the condescension of posterity’. How far he succeeded is rightly still open to debate, but he made an extremely well argued case. Far from Charlotte being simply a reactionary high Tory in the Wellington mould Dr Roberts places her in the Radical-Tory tradition alongside Richard Oastler and Parson Bull of Bierley. As such, her novel Shirley is not simply a romance, which uses Luddism as an exciting backdrop, but part of the ‘Condition of England’ genre, arising from the social and political conflicts of the 1830s-1840s, which sought to draw attention to the plight of the working classes. Her comment to her publisher in 1849, that on reading Elizabeth Gaskell’s Mary Barton, (perhaps THE classic Condition of England novel), she found she had been ‘in some measure anticipated both in subjects and incident…’ reveals that she identified with this kind of social realist writing. But while Mary Barton was a tale set in a contemporary Chartist context, Charlotte chose the historical events of 1812 for her story and for her observations about social conflict. Tory-Radicalism existed in an uneasy alliance with working class democratic radicalism throughout the 1830s and 40s because of the hostility of both to the consequences of unfettered industrial development. Industrial capitalism, for the Tory-Radical, was a force which was corroding the natural order of things and destroying the paternalist bonds which held community and society together. Consequently they could see the rationale between workers’ efforts to oppose it, even if they didn’t approve of their methods. Charlotte’s views of these conflicting forces, argues Dr Roberts, can be see through her drawing of the characters in Shirley. On the one hand, Robert Moore, the owner of Hollows Mill, and on the other the Luddites personifying different aspects of Luddism. The latter, said Dr Roberts, are less caricatured and more nuanced than Charlotte has often been given credit for. Moore starts off as the ruthless, grasping, progress-chasing, free-market capitalist, contemptuous of the concerns of his workers and archetypical of the Whig, Nonconformist (and often nouveau rich), manufacturer of the West Riding. It was this rising type of bourgeois, lacking responsibility to their communities, or noblesse oblige, that the Tory-Radicals blamed for destroying social bonds and creating friction between the classes. It is underlined in Moor’s case by the fact that he is an outsider. There is a vast cultural gulf between himself who he regards as ‘civilised’ and his workers who are ‘savages’. But, before the end of the novel, following the attack on his mill, Moore in fact undergoes a conversion, sees the error of his ways and pledges to use his money for good and to help his fellow man. He also survives an assassination attempt and, as if in an act of contrition and social reconciliation, no effort is made to apprehend his attacker. From one archetype he becomes its opposite and is now the Tory-Radical’s ideal of a paternalistic and benevolent employer. Thus far there is nothing contentious in Dr Robert’s analysis and these points have been made by Andrew and Judith Hook in their introduction to the 1974 Penguin Classic edition of ‘Shirley’. How Charlotte portrays the Luddites is far more problematic. 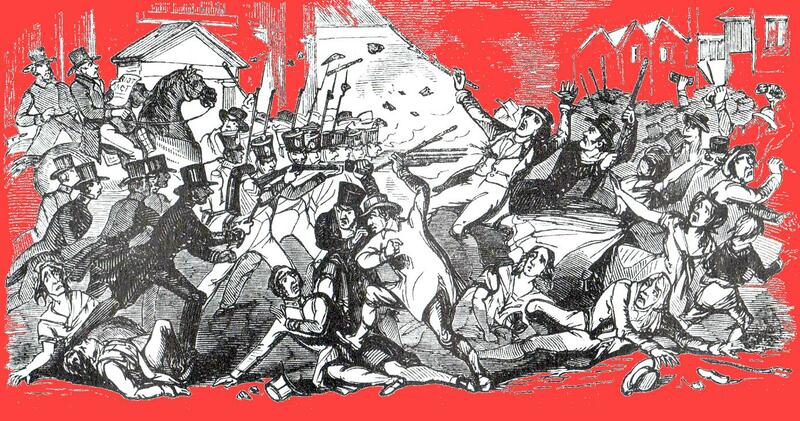 The reactionary 19th century view of working class movements, particularly those engaging in direct action, whether Luddites, trade unionists or Chartists, was that they were a mindless mob, manipulated by leaders who were cynical demagogues, (usually outsiders), pursuing their own devious agenda for self aggrandisement (a view not much changed today in some circles). Charlotte does not subscribe to this stereotyped view, but her depth of understanding of historical Luddism is less well defined. It is with regard to what she has to say about historical Luddism that Dr Roberts’ thesis is perhaps less well substantiated. Moore’s response is to call him a drunkard, roll out the standard accusations of demagoguery and reiterate his determination to introduce machinery. He also accuses Barraclough of breaking his shear-frames as they were being carted across the moor and arrests him at pistol point. Following this violent response another workman, William Farren, tries to reason with Moore, describing their plight and while accepting that new inventions were inevitable and deprecating violence, ‘it isn’t right for poor folks to starve.’* He calls for a political solution saying that parliament should intervene. For Charlotte, Farren is the type of the honest, salt-of-the-earth worker, who lives in a clean cottage and is respectful to his social superiors. By arrogantly ignoring his plea without ‘a whimper of good-will, or hope, or aid.’ Moore makes a violent clash inevitable. This scene ably epitomises the two main historical responses of the croppers to machinery. One, to humbly beseech the manufacturers and seek help from Parliament – the other to use both the threat and actual direct action to stop the machines. Charlotte’s sympathy is clearly with Farren, but she understands how the failure to respond to his appeal for natural justice leads to the second response – as do efforts to merely resort to physical repression as with Moore’s arrest of Barraclough. The other main Luddite character, Michael Hartley, is also described as a religious fanatic, ‘that mad Calvinist and Jacobin weaver.’ He is ‘crazed’, expresses himself in ‘ravings. And ‘would be half a poet, if he were not wholly a maniac.’ He is also ‘uttered strange blasphemy in his Antinomian fashion’. Dr Roberts sees this reference to Antinomianism as significant and the speculation about what Charlotte meant by this made one of the most interesting and yet perhaps most tenuous parts of his talk. There was certainly no shortage of Antinomians both in the early 19th century and in the 1840s, people who rejected all established religious, political and moral law and who expressed it in personal eccentricity, or the formation of sects, often with a Millenarianist or eschatological ideology, ie an anticipation of the more or less imminent end of the world. In the 17th century they were generically referred to as ‘Ranters’, a term revived to describe the more enthusiastic non-conformist preachers such as the Primitive Methodists. But why Charlotte should depict religious Antinomianism rather than outright Atheism as a moral threat isn’t really apparent. No doubt somewhere in the vast literature on the Brontes, or the Transactions of the Bronte Society there is an explanation. Also, why Charlotte should identify this ideology with Luddism wasn’t clearly explained by Dr Roberts. Indeed there was a millenarianist strand in working class religion and politics in the early 19th century in particular, when great change was anticipated and signs of its coming were sought. We have mentioned this in Liberty or Death, which Dr Roberts acknowledged with regard to the shadowy ‘Ezekialites’. However, how strong an influence this was in determining the motives and actions of the Luddites is speculative. Even if it was, it is difficult to see how Charlotte would have been aware of it – unless she was informed by oral accounts unrecorded elsewhere. Dr Roberts sees this element as further confirmation that Luddism was a backward looking movement engaged in an old forms of ‘protest’, machine breaking, threatening letters, physical attacks in contrast to the process of ‘modernisation of popular protest,’ heralded by Chartism – peaceful demonstrations, petitioning, propaganda etc. This is not a view I share. Luddism was not merely looking backwards. It stood at the gateway of the industrial revolution and, Janus faced, it looked both backwards and forwards. As Dr Roberts said in response to a question, the croppers had tried parliamentary lobbying and legal arguments before they were forced to fall back on ‘old’ methods of struggle when the legal path was closed to them. Charlotte Bronte was not interested in factional party politics, but that did not mean that she was apolitical. She even saw some understanding of why people were driven to direct action. Dr Roberts explained that he had omitted a discussion on the light Shirley throws on ‘the modernisation of popular protest’. Perhaps here is the only axe I have to grind with Dr Roberts. ‘Popular Protest’ has to a large extent become post-modernese for ‘class conflict’, or the now taboo ‘class struggle’. It is seen as just another reflection of social conflict and not as a manifestation of a fundamental dynamic of social change. I would argue that the industrial revolution cannot be understood without a concept of the class struggle which was taking place. However, I am the first to admit that class struggle views have often by presented simplistically and an insightful view of the Luddites has been a casualty of this. Charlotte Bronte’s Shirley, for all its faults as both literature and history, does have something to say about ‘popular protest’, or class struggle in the 19th century. Dr Roberts foray into this is to be valued as a contribution to creating a more multi-faceted view of working class history. The Brontes and the Luddites are both perennial topics of interest and integral parts of our West Riding Pennine culture. Together they are a successful recipe for a panoramic view of early 19th century history. In the wide range of his talk, Dr Roberts gave us more than a glimpse of that panorama. Hopefully future Luddite Memorial Lectures will measure up to the high benchmark that this inaugural lecture has established. Philip ROGERS, ‘Tory Brontë: Shirley and the “MAN”’ Nineteenth-Century Literature, Vol. 58, No. 2 (September 2003), pp. 141-175. Herbert J. Rosengarten ‘Charlotte Brontë’s Shirley and the Leeds Mercury’, Studies in English Literature, 1500-1900, Vol. 16, No. 4, Nineteenth Century (Autumn, 1976), pp. 591-600. Susan Zlotnick , ‘Luddism, Medievalism and Women’s History in “Shirley”: Charlotte Brontë’s RevisionistTactics’, NOVEL: A Forum on Fiction, Vol. 24, No. 3 (Spring, 1991), pp. 282-295. Luddism through the Chartist Looking Glass: Shirley and the Modernisation of Popular Protest. Dr Matthew Roberts, (Sheffield Hallam University). Was delivered on Thursday 16 January 2014.